Here are two final examples of loving ways to approach mental illness with people. If you're feeling lost as to how to approach your friend, tell them how you feel. Chances are, they feel the same. No one really knows what it’s like for any particular person, and we’re all a bit clueless! So here are some more ideas of helpful things you could say when moving towards a brother or sister in Christ. 4. Mentioning the 'elephant in the room'. If your motivation is genuine concern and care, you won’t do harm by asking about these things. Mental health has a stigma attached to it that can only be broken when we are comfortable enough to speak openly about it. Mentioning the elephant in the room is a way to show love. If your friend is grieving, ask them to tell you about the person they’ve lost. If your friend is depressed, ask them about what used to make them feel happy. Even if you think your friend is suicidal, you won’t increase the risk by asking them. If your motive is love, never be afraid to ask. There is a lot to be learnt about the majority of mental health difficulties. We need to approach people with the kind of humility that knows “there are so many things I do not understand” and the kind of humility that is ready to ask for forgiveness often. It is right to seek a greater understanding of your friend’s situation. Studying the experience they might be having, could be helpful in the long run. Reading books by people who have gone through similar struggles may you give you some words or questions. Having said that, there is merit in just admitting your ignorance and asking them to cover your blank slate personally with their unique situation. Questions like this give you a better understanding of their understanding of the problem. No textbook or autobiography can give you that. Be humble. There might seem like a lot to take in and keep in mind this week: Say this, don’t say that, ask this, never suggest that. It was never my intent to leave you feeling daunted. In fact, I want you to feel confident. I pray that these articles and testimonies will fill you with the kind of confidence that believes that the tools we have in Jesus Christ (prayer, Scripture, love, and compassion) are immensely powerful. The very fact that you’re reading this shows that you care about people in the area of mental health; what a gift of the Spirit that you’ve been given that love for others. Don’t let that love put you on egg-shells. Your friend, no matter how fragile they may seem at the moment, has the power of God protecting them. Trust in the Sovereign Father as you move towards them boldly in the knowledge and love of Christ. 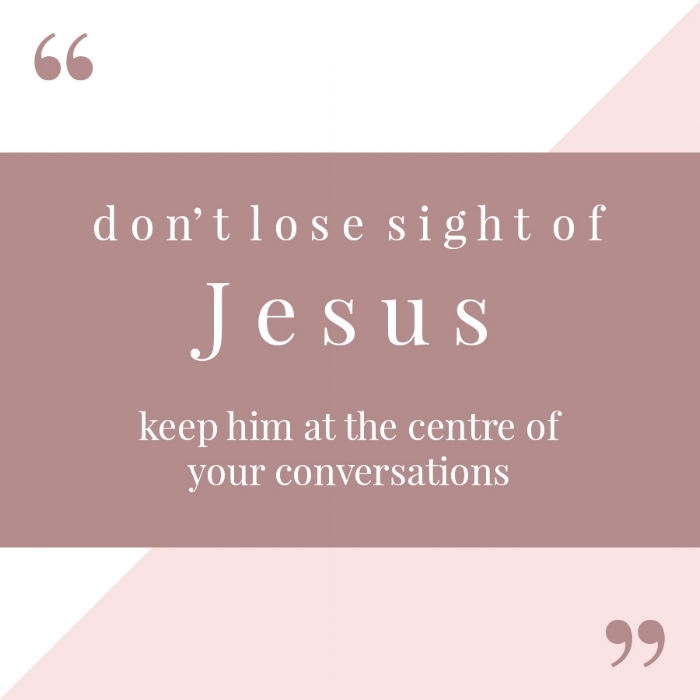 Most importantly, don’t lose sight of Jesus. Keep Christ and him crucified at the centre of your conversations (1 Cor 2:2) in the firm knowledge that “suffering from broken bodies cannot restrain Christians from spiritual growth and even fruitfulness”. Abby became a Christian aged 20 and joined the More Precious team a year ago to oversee City Reps. Abby recently graduated in Psychology from Sheffield and spent some time with CCEF studying biblical counselling in the USA. Abby is now continuing to study back home with Biblical Counselling UK and gaining experience before applying for the Clinical Psychology Doctorate. Abby has been touched personally by the destructive effects of mental health and is, God-willing, dedicated to the battle against mental illness from all angles.